South of Seeland and The Funen lies many smaller and a few larger islands - The South Eastern Isles. This is the southernmost and warmest parts of Denmark. On many of the islands one cacn see large fields with sugar-beet plants, which can be grown here in the good climate. The sugar-beet farming in this part of Denmark provides enough sugar for the whole country and made Denmark toatally independent of the sugar-cane production in the tropics when Denmark sold its last tropical colony - The Virgin Islands - to the US in 1917. All though much of the land is used for farming there are also place for the nature and the flora has some plants with a southern distribution. 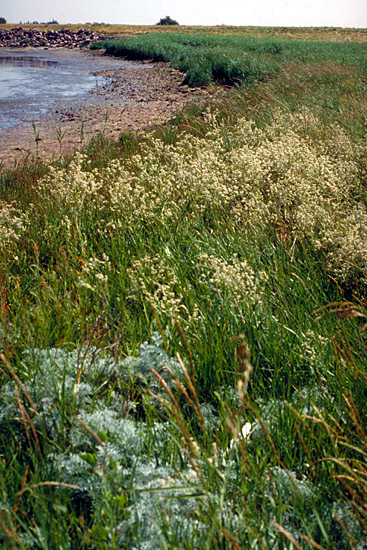 The picture shows a salt marsh with flowering Dittander (Lepidium latifolium) and the greyish Artemisia maritima. Dittander is in Denmark only found in the southern parts.